Star diagonals let you view objects at a 90° angle from the direction the telescope is pointing, which means viewing will be much more comfortable, especially when the telescope is pointing straight up. The 918A slips into 1.25" focusers and visual backs, and accepts any 1.25" eyepiece. This is not the best diagonal when using your telescope as a "spotting scope" during the day for viewing wildlife, etc., since the image is right side up, but reversed from left to right. A better choice for land viewing is the 45º Erect Image Diagonal, which will display a correctly oriented scene in all directions (right side up, and left-to-right correct). 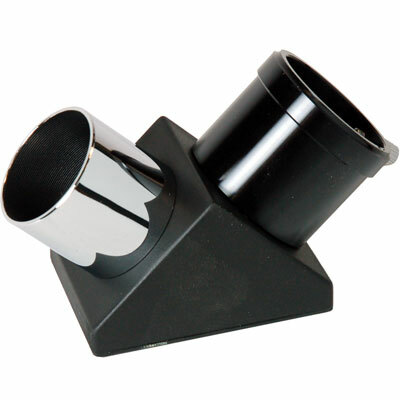 The 918A prism star diagonal comes standard with most LX-series telescopes. A nice replacement for "department store telescope" diagonals. Fits into 1.25" focusers, accepts 1.25" eyepieces.